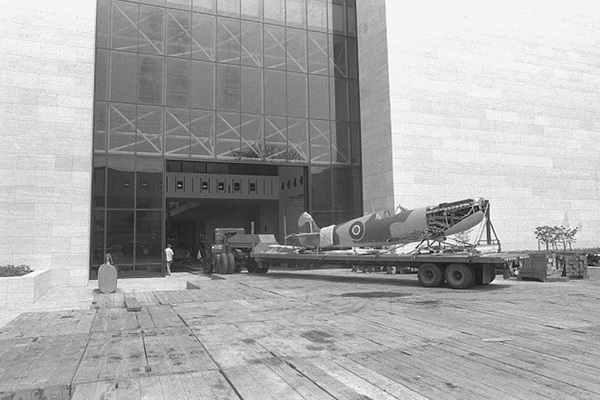 “Spitfire Airplane Arrives at the Air and Space Museum,” Histories of the National Mall, accessed April 22, 2019, http://mallhistory.org/items/show/489. Before the National Air and Space Museum opened in July 1975, objects like this WWII-era "Spitfire" airplane arrived. To get the plane inside the museum, its wings were temporarily removed and it was led through the museum's west end windows. These windows were designed to open in such a way that large objects, such as aircraft and missiles, could easily move in and out of the museum.